Yours is pretty maxed out, too. I like the selection of pedals that have shown up so far on this thread. Awesome choices, great layouts. The IEC plug came from an old computer power supply. But you can buy them from electronic shops like Deeco (? sp). There's a guy on TGP who consulted me on how I did the PT Mini mod (mounting a Fuel Tank Jr underneath the Mini). Gladly assisted him. He's now professionally doing all sorts of mods on the Mini. He's a good guy so I was glad to help. 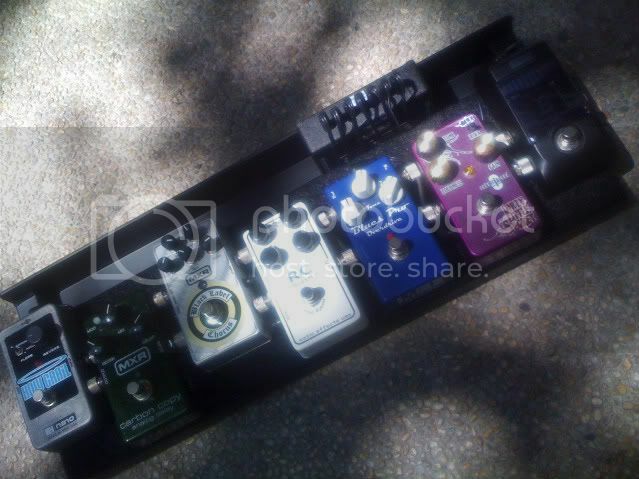 Search "Bart Pedaltrain Mini Mod" on TGP. Nice. Very cool mod & great idea! Thanks for sharing! 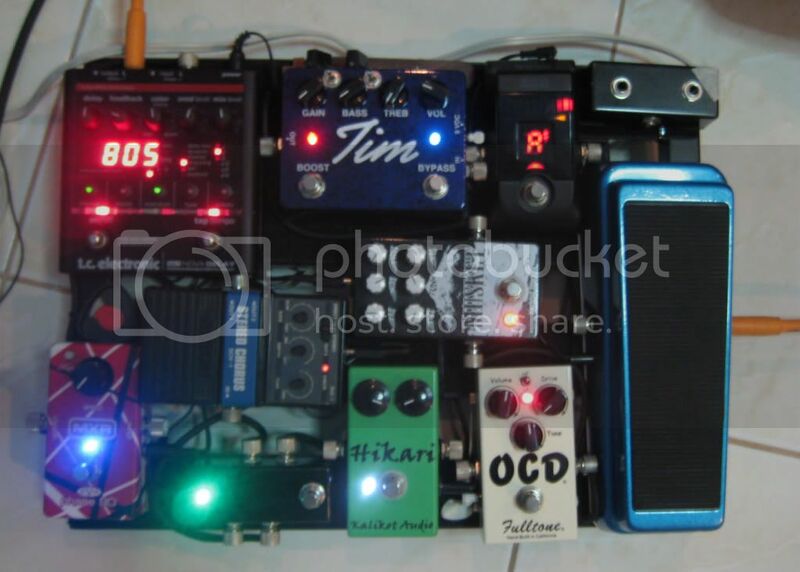 available ba pedaltrain dito sa pinas? pedaltraiiiiin!!!!! turi!! oi thanks pre..
Guys, OK ito sa batcake. Never had problems in dealing with him. He just doesn't like to post. Lawl. 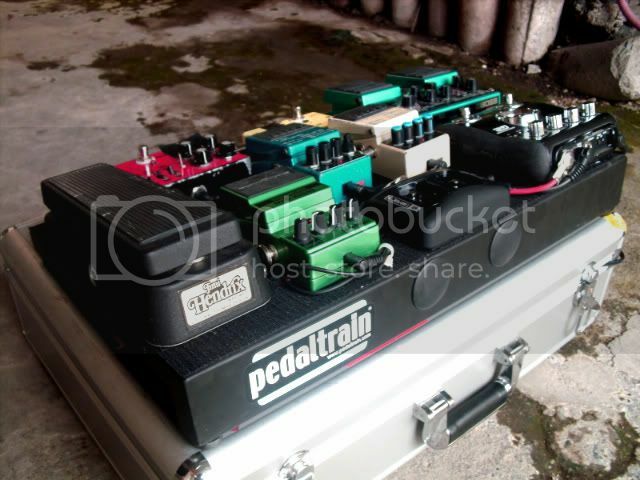 Pedal Train Thread! Great boards! i'm itching to downsize my board to get a pedaltrain mini. i'm still in the planning stage now. PT nano ba dapat dito o mini? 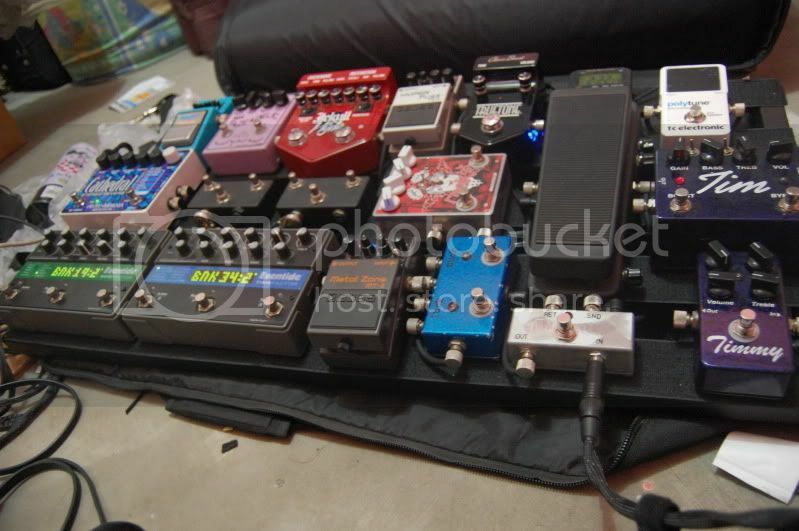 I'm drooling over these pedalboards for months already.. Kept asking Turi what's the safest PT to get from him.. Maybe a Junior but I like Mini's simplicity and portability.. but my pedals lately are the size of sansamp gt2's so it favors the Junior, but what the heck! Hey Joel! That's a pretty good board! Looks like you revamped your setup since I last saw it.. From a Gator Pro to a PT mini! Me like it! I'm curious about the zw chorus as well! can't do the nano man. too small. The 'safest' is the PT2. Always. Gives anyone ample space to move around with. I've had clients that bought the PT Jr .. THEN .. the Pt2. Check out the price at my website. Very small price difference for bigger space. lawl. I'm a PT fanatic (obvious ba? ), but I can't see the point of the Nano. What about this kind of setup? Is this possible and even usable? 8 MXR-sized Pedals arranged this way..
Patches are arranged from compressor up then down then so on until the carbon copy-out..
Patch cables should be pancake ones. You're looking at damaged knobs in the future. Yeah I think so too and lots of misfired pedals during live gigs. I received your sms a day ago about the items hehe. I think we're going to have a deal this august! Actually, this is my 2-3-songs-board. My main board is undergoing some renovation, hehehe. Your proposed Mini layout is quite difficult to put together- the DC plugs are not always on top, and if they are, you'll have to find angled ones- they're quite rare locally. Even if you use those, they'll eat up about half an inch of space between pedals. 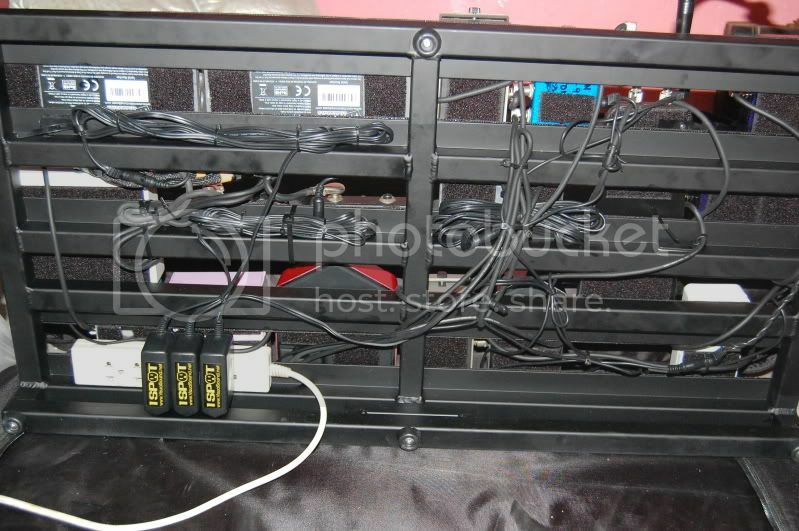 You'll also need to modify the underside of the Mini to fit a power supply, since the slot on top is already occupied by pedals (or you can use a 1-spot). IMO, you should ditch one pedal, that's more workable, though it would still take a lot of planning to have it all fit comfortably on the Mini. Still the same board I posted a while back. For me, sound quality and minimum signal loss as possible are more important than cleanliness and tetris. 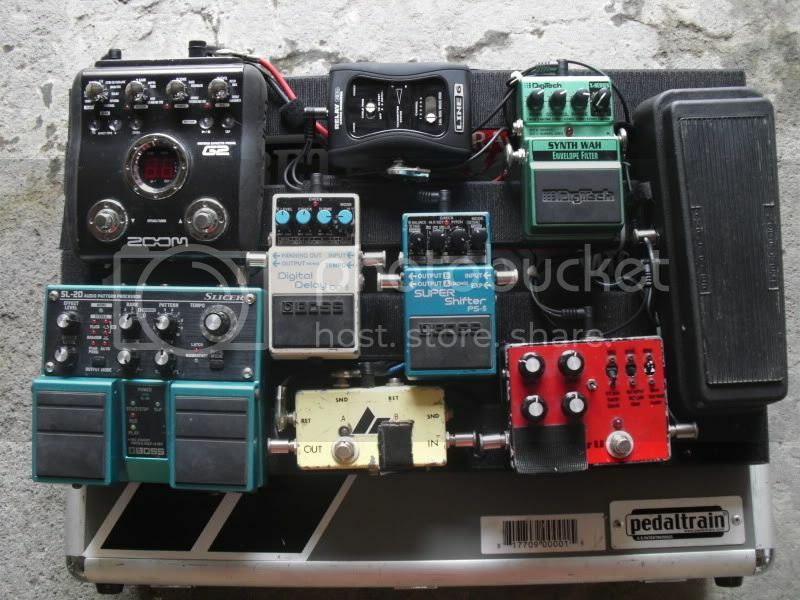 Actually, i would think that pedal arrangement directly addresses sound quality and minimum signal loss- I arranged my pedals in such a way that cable length would be minimal- I have less than 1 foot worth of patch cables in my Mini. In my main board, I'm incorporating a 10-loop switcher, but even with that, I'm trying to figure out an optimum arrangement where cabling will be at its minimum, even with the looper engaged. Nice! for me, pedals and short cables should just to do their job and not ruin the tone or change the color of it as much as possible. Shortest possible cable from the guitar to the amp is the way to go.